When I first began getting paid to test software, I was a little confused. I knew it was invigorating to catch scary bugs prior to production but I wasn't really sure how valuable my job was to my dev team or the rest of the world! In fact, I didn't really know if testing software was anything to make a career out of in the first place. 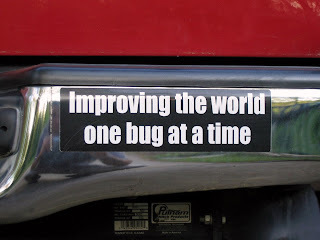 A few years ago I came across Harry Robinson's Bumper Stickers for Testers post on StickyMinds.com. It was at that point that I decided my job as a software tester was valuable (and even a little cool). 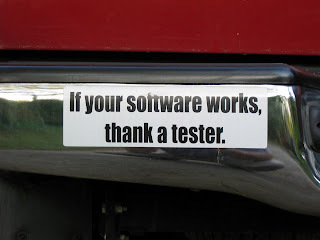 Harry and all the other software testers who contributed the excellent material on said post inspired me to take pride in my job and now I even sport a couple bumper stickers to show it (see below). If you test software, I encourage you to do the same.